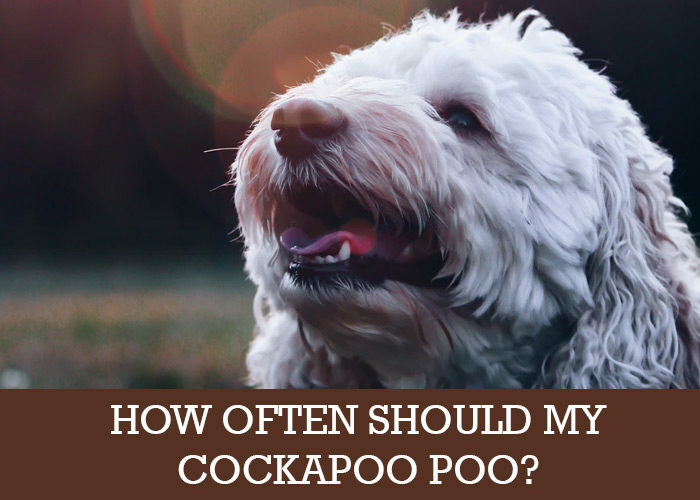 Blog > Training > How often should my Cockapoo poo? 1 The same goes for your furry friend. Let’s discuss poop for a minute. 3 Pooing too much? What to do. Everyone loves the front end of a Cockapoo. That furry face, full of personality can warm the coldest heart. If we had the time, we would spend all day interacting with the fun end of the dog. The other end of your Cockapoo is the business end. We don’t exactly focus a lot on the end of the dog that smells come out of, but we know that what goes on is important. Everybody has to poop. Think of your own routine. If you are eating right, life is good and stress levels are low, you probably poop around the same time (or times) every day and it is a satisfying experience (sorry if my choice of words is amusing – but it should be satisfying). The same goes for your furry friend. Let’s discuss poop for a minute. On average, a dog should poop between one and five times a day. As with us humans, it can vary with age, diet, lifestyle, exercise and health. You know your dog better than anyone. Make sure you heed any change in their pooping routine and consider the factors that might be causing the change. Puppy poop – Age is indeed a key factor, A puppy will poop a lot more than an older dog. Once you start to train the little bundle of fun, take note how the poop patterns change. If your pup is pooping more than 5 times a day as you train him, something else might be going on. Has anything changed? A dog’s tummy is a sensitive place. It will adapt to a new food. If there is more waste to get rid of, or less, the poop patterns will change. There will be more or less poop. It will usually be a temporary thing and a new routine will become the norm. Search the web for lists of good or bad snacks to give your dog. You might be spoiling your best friend with new goodies that are having an effect. If you move home, or completely change your dog’s environment, it will obviously have an effect. Also think about how other changes to the environment may change things for your dog. Renovations? Work on your house? Rearranging your furniture and changing the layout of your rooms? All can affect your dog. Essentially, they are creatures of habit and love routine. Any change can trigger a reaction. Have you added a new pet, a different animal or a baby to your household? Everyone needs to adapt to a new face. Tummy’s can be upset. If the problem persists, a visit to the vet should take place. Many things can trigger a temporary change, but it might also be a symptom of a problem. A change in poop habits and what is coming out of the business end of your dog is often the first indicator of a problem. Irritable bowl syndrome, colitis, internal parasites – a horrible list which we need to be aware of. Pooing too much? What to do. Where is your dog pooping? If your Cockapoo suddenly poops in new places, something is going on. Your dog usually has his or her favourite poop spots. Inspect the poop. The fun part of dog ownership. Loose and runny rather than the usual firm poop can be a sign of diarrhoea. Runny poop should normally be a quick fix. Switch up the diet, check for secret snacking. It should solve the problem within days. If it does not change and become firm, or you notice blood or mucus, see your vet. It really is all about knowing your dog’s routine. It starts with the training. Establishing poop spots for your Cockapoo and taking walks and poop-opportunities at regular times allows you to monitor the flow (so to speak). A happy, stress-free Cockapoo will poop regularly and normally. Don’t be upset if there is suddenly a change, a random mess to clean or an accident. Note it and fix it.